Made well, color was a little off or what I wanted but I kept them anyway. The crisp, clean lines of these tailored shams make them theperfect addition to any bedding ensemble. 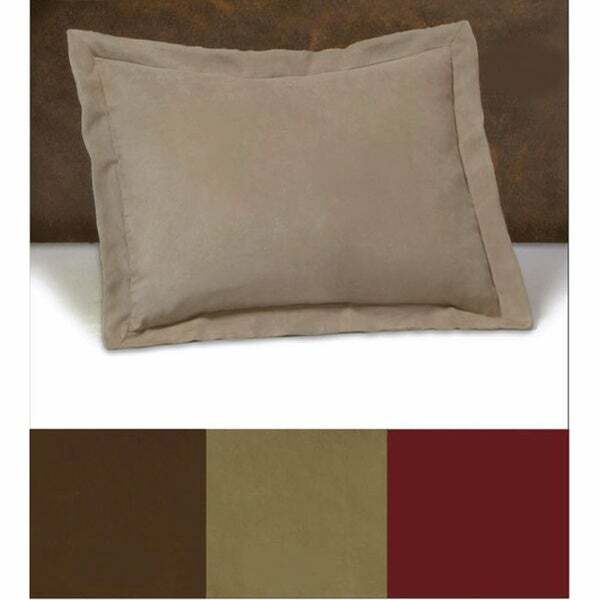 The shams come in eithermink, moss or brick shades and are sure to complement your desiredcolor scheme. Available in standard or king sizes, these microsuedeshams add comfort and softness to your pillows, making it easier toget a good night's sleep. Fashioned of polyester microsuede, thesoft shams are durable and machine washable, so caring for them iseffortless. This was purchased to match the bedskirt and the quality was good and colors match each other. I am using this on a personal bed so it gets more "wear and use" than if it was on a guest bed, so after using it for several years at a vacation home, it has not disappointed. It matches the flannel duvet and sheet set in a green and white floral print, as well as a cotton "autumn" look duvet set from **. I anticipate it will also match a spring-summer floral bird/butterly look I recently purchased on sale from **, so it is a very versatile color and quality. I am very satisfied with these purchases. The moss is a pretty green color, not too dark or light. The feel of these on your face is so soft. They are ample sized as well. I got the dust ruffle too for my cal. king bed and it fits perfectly. I did need to iron these. But they are wrinklefree now, even upon using them. Tried another brand comforter in micro suede and had static issues, but not these. So I got these in brick hoping they would be a deep berry red color to match my quilt (because other reviewers noted that they were red) ... and they are! They are nicely tailored and the quality is great. The price was good, too. Very happy with this purchase. I ordered the taupe color and it seemed like a tan color on my computer. When I got them I saw that they were nothing like the picture. They are a very light taupe...almost cream colored; more grey than tan in them. The quality is okay but the flange is floppy. If you are interested in these shams, look for reviews of people who have bought the color you are thinking of to get a better idea of the color you want. I loved the microsuede shams! Too bad there weren't more color choices in thjem. "Mink" is not a very dark brown so these didn't match my other colors. I was looking for decorative pillow shams that weren't "flimsy" and these worked perfectly. the shams are very nice. My only problem with them is that they have deep wrinkle lines where they were folded, and it says do not iron. I've had them a few weeks now, and the fold lines have not disappeared. Hopefully washing will take care of that, but I have not gotten around to that yet. The material is excellent and washes well. Very soft and cozy. Love having them on my bed. I ordered the dark brown color. It is a good color with my decor. I wish the trim/edges would stand up and be firmer - that's the only reason I did not rate them "excellent". Otherwise, and especially for the price, these are winners! I am glad I found them. These shams are perfect! The red color is a nice dark red, they are very soft, and wash up well. Very happy with this purchase. I love these shams. I have been looking for quite some time for King Sized shams. These are the right fit, soft and look great. The microsuede feels luxurious and makes a great addition to the beds. These are nice, a bit thin, but decent. The brown was not a match for our couch. I was looking for a rich dark chocolate brown. The dark brown of this is more of a medium yellowish brown. Not very happy with either the color or the fabric. Shams are very limp and do not fit well. This was a package of two but the colors were completely different. A bit thin and they don’t stand up like the thicker shams do. Decent, but not worthy of 5 stars. The clod was as advertised and the king fit was perfect. The microsuede fabric not only looks fabulous but feels wonderful as well. Used as part of multi-fabric, texture, and material delivery orative pillows on the bed. Nice material. The flange is a little floppy. Color is perfect, just like photo, for me. These shams are very nice and soft. Look great too. Bought a lot of these. Wash up easy care. Good "hand", well-made, easy to maintain. I use these for couch cushion covers. This set is rich in color and is easy to maintain. was not what I expected. fabric not high quality. "These shams state both cotton and 100% polyester... which is it?" We apologize for the confusion. The material is polyester. I plan to use these for cushions on my sofa and thought the material would hold up well. Color matched my comforter. Really wanted standard out had to settle for king.